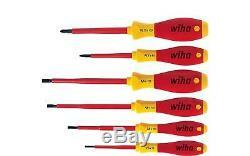 Screwdriver Tools Set Electric SlimFix Range SoftFinish Handles Wiha 6 Pieces. 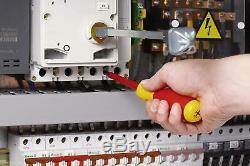 Screwdriver Tools Set Electric SlimFix. 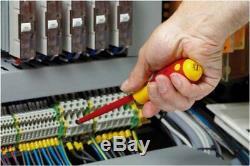 VDE Certified and GS tested Screwdrivers. Safety when working with live equipment up to 1000v and 1500 V DC. Insulated, ergonomic handle and blade. Multi-component SoftFinish handle provides maximum comfort. 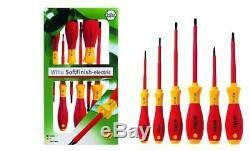 Screwdriver Tools Set Electric SlimFix Description. Wiha's VDE screwdrivers have high-quality blade insulation that is moulded directly onto the blade and therefore guarantees safety when working on live equipment up to 1,500 V DC/1,000V AC. Each screwdriver is individually tested in a water bath at 10,000 volts as required by IEC 60900:2004. Awarded the GS symbol for tested safety. A multi-component SoftFinish handle provides maximum user comfort. Wiha Screwdriver set SoftFinish electric SlimFix Wiha Screwdriver set SoftFinish electric slimFix Slotted, Pozidriv 6-pcs. (25477) Wiha's SlimFix screwdrivers have a blade that is up to 33% narrower than normal VDE screwdrivers, due to the integrated insulation system. This allows easy access to small apertures without having to damage the screwdriver shaft itself. Wiha Quality These Wiha screwdrivers are part of the Wiha SoftFinish electric SlimFix range - providing users with easier and protected access to deep-set screws whilst working on live parts. They also help protect your ergonomic health with the patented SoftFinish handle design, ensuring work is kind to hands and muscles. 1x Screwdriver SoftFinish electric (00820) , Slotted: 2,5 , Visible blade length: 75. 1x Screwdriver SoftFinish electric (00822) , Slotted: 3,5 , Visible blade length: 100. 1x Screwdriver SoftFinish electric (00824) , Slotted: 4,5 , Visible blade length: 125. 1x Screwdriver SoftFinish electric (00826) , Slotted: 5,5 , Visible blade length: 125. 1x Screwdriver SoftFinish electric slimFix (00878) , Pozidriv: PZ1 , Visible blade length: 80. 1x Screwdriver SoftFinish electric (00879) , Pozidriv: PZ2 , Visible blade length: 100. The item "Screwdriver Tools Set Electric SlimFix Range SoftFinish Handles Wiha 6 Pieces" is in sale since Friday, January 18, 2019. This item is in the category "Business, Office & Industrial\Hand Tools\Screwdrivers". 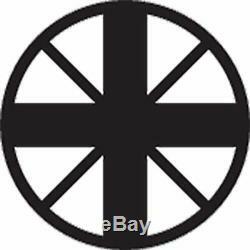 The seller is "*db_stores*" and is located in Birmingham. 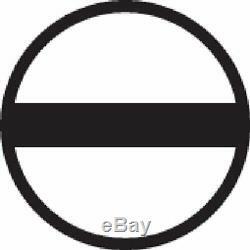 This item can be shipped to United Kingdom, United States, Japan, Canada, Ireland, Australia, Germany, France, Greece, Italy, Spain, Austria, Belgium, Bulgaria, Croatia, Cyprus, Czech republic, Denmark, Estonia, Finland, Hungary, Latvia, Lithuania, Luxembourg, Malta, Netherlands, Poland, Portugal, Romania, Slovakia, Slovenia, Sweden, New Zealand, China, Israel, Hong Kong, Norway, Indonesia, Malaysia, Mexico, Singapore, South Korea, Switzerland, Taiwan, Thailand, Bangladesh, Bermuda, Bolivia, Barbados, Brunei darussalam, Cayman islands, Ecuador, Egypt, Guernsey, Gibraltar, Guadeloupe, French guiana, Iceland, Jersey, Jordan, Cambodia, Liechtenstein, Sri lanka, Macao, Monaco, Maldives, Martinique, Nicaragua, Oman, Pakistan, Peru, Paraguay, Reunion, Saudi arabia, South africa, United arab emirates, Ukraine.